If you're using creative resumes to apply for jobs, and you're not getting invited to interviews, it could be that so-called "modern resume" that's keeping you unemployed. Here's what's wrong with creative resume designs and what to do instead. What, exactly, is a creative resume? When I refer to creative resumes, I'm talking about resumes that use non-standard design and organization in an attempt to stand out from the competition. Typically, they are created with a pre-formatted template. "Creative" resumes, in one form or another, have been around for years. Years ago, when I was fairly fresh out of university, I worked as an adult education teacher. There was a lot of drama and upheaval in the company, so most of the teachers there were openly looking for new jobs. I'll never forget the day one of my colleagues showed me her resume. She said she was applying to a job working with children. She wanted to stand out from the competition and show that she was creative. How did she attempt to stand out and show the employer her creativity? She printed her resume on rainbow paper. 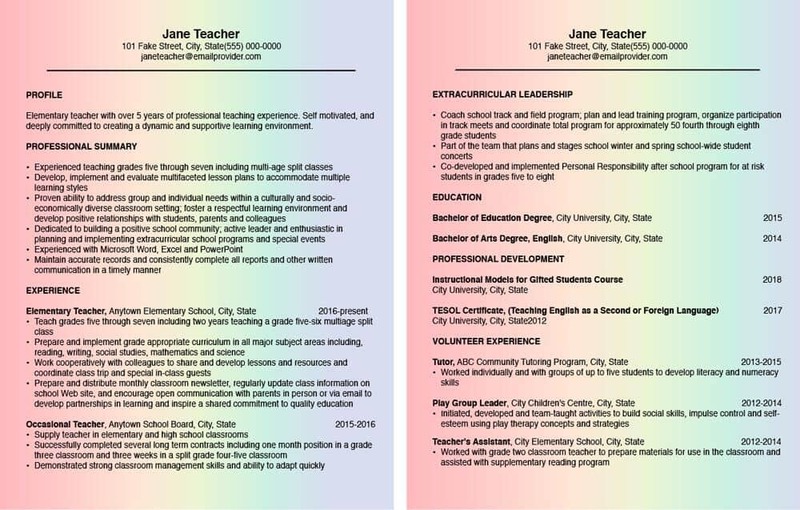 Printing a resume on rainbow colored paper didn't prove anything about her creativity. It might have drawn extra attention, but that attention would not have been positive. The resume looked goofy, and it showed that she was unable to make appropriate, professional choices. She never did get invited to an interview for that job. Today's creative resume formats are the equivalent of this big resume fail from the past. High design, low substance resumes are today's equivalent of printing your resume on rainbow paper. Job seekers today might know better than to print resumes on fancy paper, but the "creative" resume templates that have popped up all over the internet are causing people to make the same kind of mistake my colleague made. 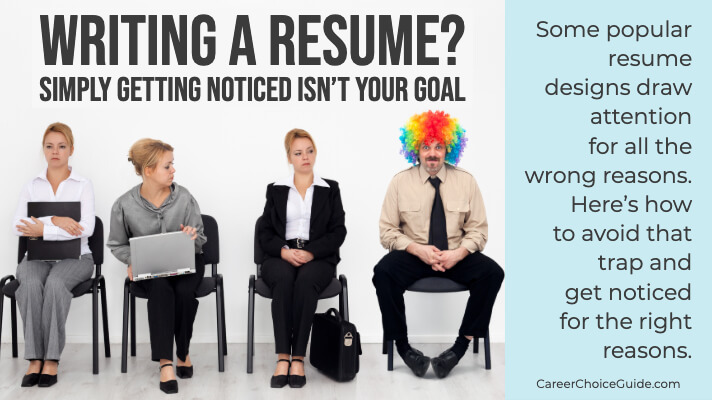 Their fancy resumes may stand out, but often not in a positive way that would make an employer want to call an applicant in for an interview. If you've never seen a creative resume design, I've made some resume mockups that are typical of this style, so you can see exactly what I'm talking about. Maybe you are familiar with this resume format. Perhaps you've even been using a creative resume to apply for jobs. If you have been using this type of resume, and you're not getting invited to interviews, there's a real chance that your modern, creative resume is the culprit. It's no wonder job seekers are being fooled into using creative resume templates. If you've been using one of these high design resumes, please don't feel judged here. Any judgment I have is for the people who promote this type of resume template online - not the job seekers who get tricked into using them. I completely understand why a job seeker might choose this resume style after researching resume design online. If you don't have a lot of experience with resume writing, and you search online for resume writing information, it would be easy to come to the conclusion that these creative resume designs are actually a modern reflection of what employers want to see. From a purely aesthetic point of view, creative resumes do look more modern than traditional resumes. In fact, some people who sell fancy resume templates promote their products with before and after shots of a traditional resume (before) alongside their "modern" template (after). Just look at my traditional resume beside a high design resume. There's no doubt the creative resume is prettier and more stylish. It's easy to get pulled in by their good looks. However, trendy and stylish is not your first priority when you're writing a resume, and it's not an employer's first priority when hiring new employees. 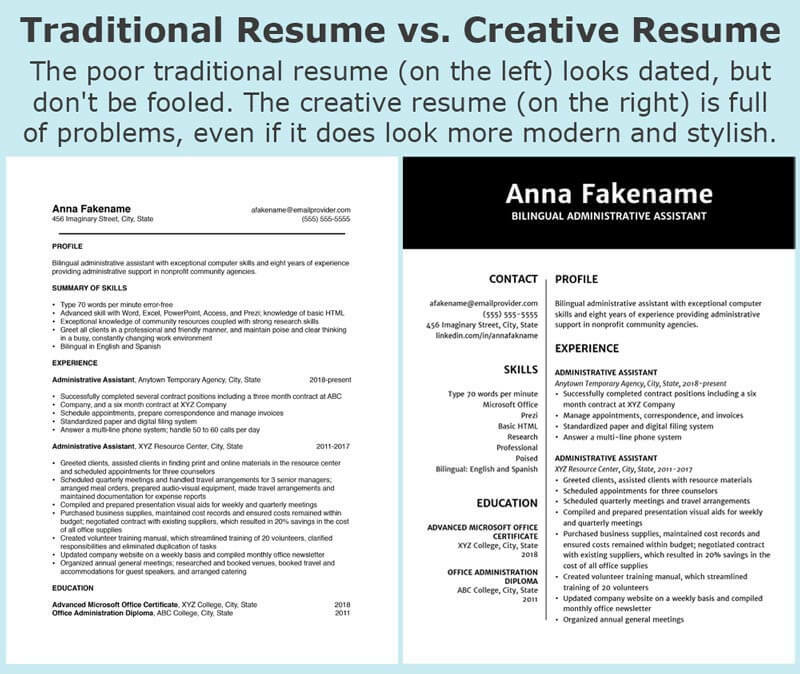 The poor traditional resume (on the left) looks dated, but don't be fooled. The creative resume (on the right) is full of problems, even if it does look more modern and stylish. If you need to learn how to write a resume, the first thing you're going to do is jump online and start searching for resume writing and design information. You won't have to search for long before you come across several examples of fancy resumes and the designers who want to sell you their templates. Jump onto Pinterest or Etsy and search for "resume". You'll find nothing but high design, low substance resumes. Maybe you're thinking I shouldn't be looking for resume help on Pinterest and Etsy. You might be right. However, Google isn't much better. When I just search "resume" on Google, I get a mix of good and bad information. When I search "resume design" the first page is full of ads and organic results for companies (largely graphic designers, not professional career advisors) that want to sell you their fancy templates. If you don't have much experience with resume writing, an internet search could easily convince you that high design templates are the way to go. I even checked with my career advisor friends. I have a lot of resume writing experience. As a career advisor, I wrote over 1000 resumes. I also had to track my clients' job search outcomes and maintain at least an 80% success rate. I was accountable. If my clients didn't find work, I would have been out of a job. In spite of that experience, all of the search results I was finding left me questioning my opinions about creative resume templates. It's been a while since I've done that intense, front line work where I was writing eight to twelve resumes per week. Maybe I was out of touch. I had to ask my career advisor friends what they thought. It turns out, every person I know who is actually responsible for helping people find work, and who is accountable for the success rate of their clients says creative resume templates are terrible. That's who I choose to trust with resume design advice, people who do this work every day and are accountable for their clients' success. 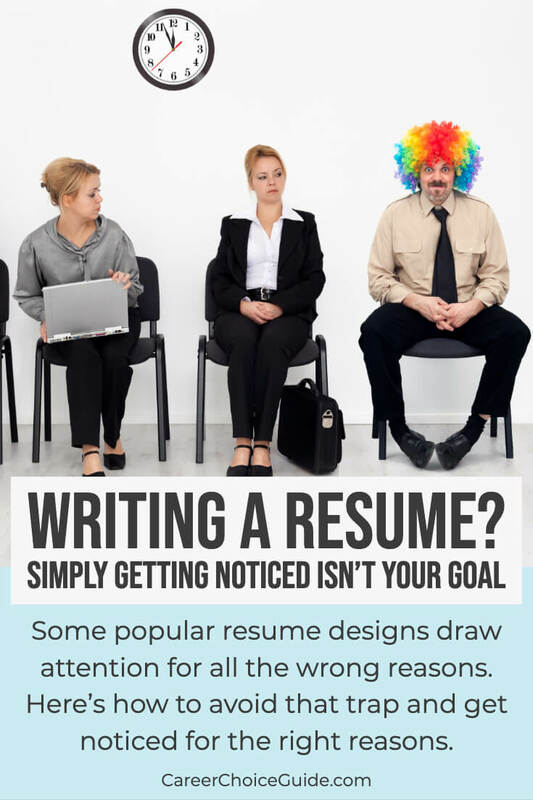 If someone like me, who has written over 1000 resumes, has to double check with colleagues to make sure these fancy resumes are a bad idea, then someone who is just learning about how to write a resume doesn't stand a chance. In fact, I'd say the proliferation of these fancy resumes online is the biggest job search lie on the web. If creative resumes look so great, why is simple resume design best? 1. Creative resumes won't pass applicant tracking system (ATS) filtering. More and more companies are using applicant tracking system (ATS) software to filter out resumes before a human ever looks at them. You won't always know whether the employer is using this type of software or not. ATS software saves HR managers a lot of time and can be used to track employees all through the recruitment and training process. However, ATS software is also known to filter out perfectly qualified candidates if their resumes aren't formatted to certain specifications. Personnel recruiting software is programmed to expect resumes that are laid out in a predictable format. If the resume isn't organized in a standard, predictable way, there's a strong likelihood the software won't parse the information correctly. When that happens, a perfectly qualified candidate who used a non-standard resume format won't stand a chance of being invited to an interview. ATS software also typically doesn't handle documents formatted with columns, tables, or images well. When the software encounters columns, tables, or images, it has difficulty parsing the information, so, again, a perfectly qualified candidate who used a resume formatted with columns, tables, or images won't be called for an interview. If a resume doesn't make it through the initial software screening, it will never be seen by a human. There is nothing truly modern about creative resumes because people who use them don't stand a chance of making it through ATS screening, the most modern technology HR managers in the recruiting process. If you want to fail ATS screening every time, use a creative resume template. 2. Employers also want resumes formatted in a predictable manner. It's not just ATS software that wants to see a predictable organization of the information on your resume. Employers want to review resumes that are formatted in a predictable manner, too. I'd be willing to bet most of the people who sell fancy resume templates have never actually had to sort through a pile of resumes to find the most promising candidates for a job. If they did, they would see all of the problems with their templates. Sorting through resumes manually is a lot of work. Plus, particularly in small and medium-sized companies, recruiting is frequently an extra task that has been added on top of someone's regular duties. The person who has been tasked with hiring new staff needs to work through the recruiting process as effectively and efficiently as possible. A hiring manager who is sorting resumes manually wants to be able review them quickly to determine whether candidates are qualified enough to merit a closer look. A resume that can be scanned quickly by human eyes has information organized in a predictable manner. On a traditional resume, the hiring manager can find the most pertinent information at a glance because it will be found in predictable places under predictable headings. In fact, The Ladders' Keeping an Eye on Recruiter Behavior study, which assessed how recruiters review resumes indicates that "Recruiters rated resumes with an obvious information hierarchy as 'easier to read.'" A creative resume makes that job harder because the information is not organized in any kind of expected manner. It's tougher for an employer to read that type of resume at a glance and find the most pertinent information they need because they first have to take time to orient themselves to the non-standard layout of the creative resume. Creative resume design forces employers to relearn where to find everything on the resume. Image you have the task of sorting through 60 resumes to find the top few candidates you want to interview, and 25% of those resumes don't use an expected format. That's 15 resumes that can't be read at a glance and make the hiring manager's job tougher. 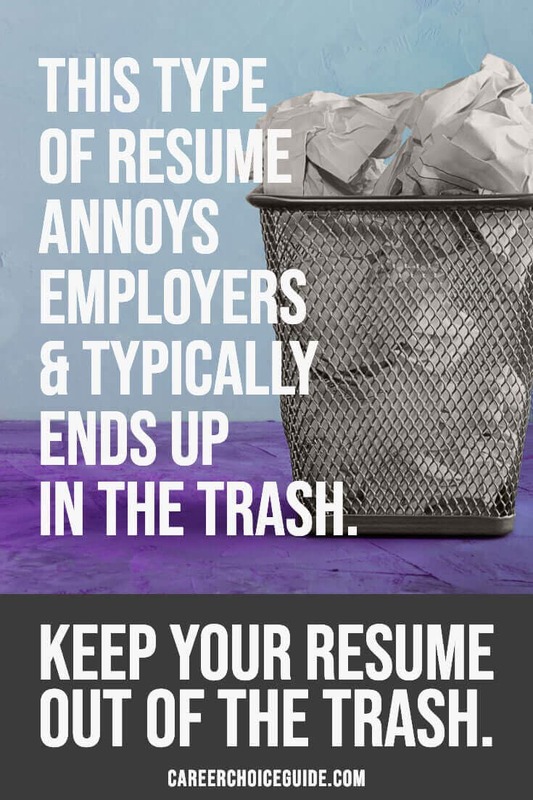 The job seeker who uses a creative, non-standard resume format runs the risk of annoying the employer because the format makes the resume tougher to read quickly. What happens when your resume annoys the employer? It ends up in the trash. Nobody wants to waste gallons of printer ink. Even in large, well-funded organizations, nobody wants to grossly waste company resources. So, when an employer receives a typical creative resume that is full of color, there's a good chance their first thought will be, "Whoa! Printing that resume is going to waste a whole lot of printer ink." Yes, some employers print resumes. They don't just evaluate them on a computer screen. Many people think better on paper. They like to print resumes, so they can make notes directly on the page and physically sort candidates into piles based on their qualifications. If printing your resume is going to require a huge waste of printer ink, the hiring manager is going to be annoyed. And you already know what happens when your resume annoys the hiring manager. Employers don't care about how modern and pretty your resume looks. They care whether your resume is easy to read and indicates, at a glance, that you are qualified enough to be invited in for an interview. 3. To show yourself at your best on your resume, you need to put content first, and you need flexibility to organize that content effectively. If you're going to get invited to an interview, you must write a resume that shows you in your best possible light and quickly communicates to an employer why you'd be great at a particular job. You accomplish those tasks, in part, by organizing everything on your resume so your most impressive selling features are highlighted and any possible issues with your work history are minimized. Good resume writers know how to take all of your experience and arrange it in a way that meets employers' expectations and shows you in your very best light. High design templates fail to give you the flexibility you need to organize your resume to your best advantage. You're stuck with the format created by the template designer, and that designer didn't have your particular work history in mind when designing the template. Creative resume templates put design first ahead of content. They might look pretty, but they don't let you show your own unique set of skills, accomplishments, education, and experience at your very best. In good resume writing, design comes last. While design does matter in resume writing, content and functionality have to come first. In fact, when I write a resume, formatting is always the last thing I do. You can't possibly format a resume effectively until you have all of the content you want to include on that resume. Once you know what information needs to go on the resume, what should be highlighted, and what should be minimized, only then can you organize and format it effectively. You never start with design when writing a resume. You start with content and end with design. That way, all of the design decisions you make can support the information you want to communicate to the employer. 4. A creative resume might not send the message you intend to send. People use creative resume formats because they think that type of resume will communicate to an employer that they are modern and up to date. They think the unique formatting will help them stand out from the crowd. This type of resume does make you stand out from the crowd, but not necessarily in the way you want to stand out. A guy wearing a rainbow colored clown wig would stand out in a room full of people dressed in business attire, but drawing that kind of attention isn't going to help him if his goal is to be taken seriously by an employer. Writing a Resume? Simply getting noticed isn't your goal. Simply getting noticed isn't your goal. Your goal is to get noticed in a positive light for reasons that will make an employer see you as a person who is a great fit for the job they need to fill. An untraditional resume can be negatively interpreted by employers. It can communicate to an employer the idea that you have poor judgment, and you are unwilling to follow standard conventions and rules. That's not the message you want send to a hiring manager in most workplaces. As we saw earlier, a creative resume can also take longer for a hiring manager to review. Sending a resume that effectively makes more work for the hiring manager can send the message that you have no regard for how your work will impact the work of others. Again, that's not the message you want to send to any employer. A well written, well organized, traditional resume is your smartest option. If you shouldn't use a creative resume template, how will you write an effective resume? The design and formatting of your resume is the last thing you should be thinking about when you start to write a resume. Content must come first. If you haven't already brainstormed your work-related experience and written points that effectively describe your experience, you're not ready to think about design at all. I've written a step by step resume writing workbook to help you do that work. It takes you through the entire process I'd go through with a client to write a resume. The book has 16 chapters. The topic of formatting your resume isn't even touched until chapters 12 and 13. Excellent content comest first; design comes last. You can start that brainstorming process with a free, printable resume writing form that is similar to the one I used to help hundreds of clients write effective resumes.